Directions (1 – 8): Study the following table carefully to answer the questions. 1. Sahib deposited an amount in Scheme II with Company A for two years. After that he withdrew the amount and reinvested only the principal amount in Scheme IV of Company C for three years. Total amount of simple interest accrued from the two schemes is Rs.1200. What was the principal amount? 2. Company D offers compound interest under Scheme II and Company B offers simple interest under Scheme II. What will be the difference between the interests earned under Scheme IIof Company D and Scheme II of Company B in two years on an amount of Rs. 1.4 lakhs? 3. Company E offers compound interest under Scheme II, simple interest under Scheme IV. Tanish invested Rs. 20,000 with this company under Scheme IV and after one year switched to Scheme II along with the interest of the first year for two more years. What is the total amount he will get at the end of three years? 4. Harsh invested an amount of Rs. 40,000 for two years with Company A under Scheme IV, which offers simple interest, andSagar invested an equal amount for two years with Company D under Scheme III, which offers compound interest. Who earned more interest and how much? 5. Jatin invested Rs. 25,000 in Company B under Scheme III, which offers compound interest calculated half yearly and Rs. 30,000 in Company D under Scheme II, which offers compound interestcalculated yearly. What will be the total amount of interest earned by Jatin in two years? Directions (6 – 10): Study the following information carefully and answer the question given below it. Out of the 10,000 candidates eligible for an Officer’s post in Public Sector Bank, 400 candidates have prior experience of working in Public Sector Banks in rural area only. 20% of the total number of candidates have prior experience of working in Public Sector Banks in urban areas only. 10% of the total number of candidates have prior experience of working in Private Sector Banks in urban areas only. 4% of the total number of candidates have prior experience of working in Private Sector banks in rural areas only. 2,100 candidates have worked in both Public and Private Sector Banks in urban areas only. 450 candidates have worked in both Public and Private Sector Banks in rural areas only. The remaining candidates have no prior experience of working in the Banking industry. 7. How many candidates have prior experience of working in Public Sector Banks (Urban and Rural areas together)? 8. What is the ratio of the candidates who have a prior experience of working in Public Sector Banks in urban areas only to the candidates who have a prior experience of working in Banks in urban areas? 9. What is the total number of candidates who have worked in Private Sector Bank in urban areas? 10. What is the percentage of the candidates who have worked in both Public and Private sector banks to the candidates who have no prior experience of working in the banking industry? Directions (11 – 15): Study the following graph carefully and answer the questions given below. 11. What is the average profit earned by the company over the years? 12. In which year is the percent increase / decrease in profit the highest from that of the previous year? 13. The expenditure of the company in the year 2001, was Rs. 45 crore, what was the income of the comapany in that year? 14. 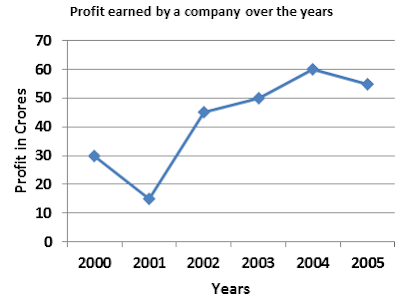 What is the approximate per cent profit of the year 2004, if the income of the company was Rs. 136 crore? 15. The income of the company in the year 2000 was Rs. 50 crore and the income of the company in the year 2003 was Rs. 95 crore. What is the respetive ratio of the expenditure of the company in the year2000 to the expenditure of the company is the year 2003? Comparing the magnitudes, we can say that the year of highest per cent increase / decrease in profit is 2002. Similarily, expenditure of company in 2003 = 95crores – 50 crores = 45 crores.